DESCRIPTION of Antiference 6 Way TV Amplifier with Bypass (F-Type) Manufacturer: Antiference UK. New house-hold CATV signal amplifiers. 1 x CATV Signal Amplifier. Signal gain(dB): 20dB. Reduce the graininess when the signal is weak. 1-in-6 out signal outlet, interfaces all set in one side. Output Port: 6. 4G FILTERED: A built-in Class 3 4G filter providing 45dB interference protection. FULL COMPATIBILITY: Fully screened distribution amplifier carries HD or 4K TV and radio, FM/DAB, Freeview, DVB-T and DVB-T2 HD TV signals. Improves your TV picture especially in poor reception areas. Labgear LDL206R 6 Way TV Distribution Ampliflier Booster with DigiLink Bypass. Labgear LDA2061LR 4G 6 Way FM/UHF Separate Inputs Line-Power Amplifier. Designed to increase and distribute TV and FM aerial signals to up to 6 TVs. 1x 6 Amplifier. Hi-Fi tuner can be connected to either of the booster outputs. For sale is a Antiference 6 Way T Unit in box unused. Model: SLX6. Power up test only. VHF: 47-230 MHz. A built-in LTE filter is included to eliminate 4G LTE interference. UHF: 470-862 MHz. LTE Protected. As well as splitting an input signal to six outputs, it can be used as a signal booster. Fully screened distribution amplifier carries analogue/digital TV and radio, FM/DAB, Freeview, DVB-T and DVB-T2 HD TV signals. Better impedance matching and therefore improved signal transfer from amplifier to cable. RED Compliant. 10dB Gain, ideal for long cable runs or weak signals. During that process you will be issued with an RMA number. 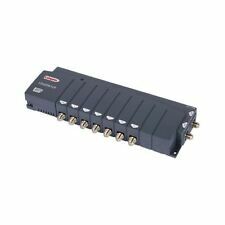 The Labgear LDL206LP is a six way aerial amplifier that is designed to increase and improve TV and FM signals. It has F connections and is designed with professional installers in mind. The unusual feature of the Labgear LDL206LP is that it can be used in a loft or roof space which does not have mains power or has restricted mains power. LABGEAR LDA206L READY 2 in 4 OUT DISTRIBUTION AMP AUTO. WITH LINE POWERING & Lte800 Filte. GAIN PER PORT 8 DP. 12-22 dB Variable Gain. 1 Input 6 Output. During that process you will be issued with an RMA number. SVHC To Be Advised. Plug Type UK. An LTE filter is included to eliminate 4G LTE interference. LTE Protected. As well as splitting an input signal to six outputs, it can be used as a signal booster. It is also compatible with TV-Links (Magic Eyes). • Variable Gain. Variable Gain. Typical Gain 22 dB. • Six Outputs. Output (dBuV) DIN45004B3 Carries, IMD3-60dB - 97. Nationwide Installation Service available. Frequency Range (MHz) - 470-862. Input Frequency Band - UHF. Compatible with DigiLink Eye. 4G filtering on DTV input to reduce interference. The unit also has a separate input for radio as well as a DTV input. Gain per port 8dB. Ending Soon. QUALITY - We Strive to Provide you with the Best Quality Products. This is ideal for when you want to split your TV aerial cable, but your TV Aerial signal isn’t powerful enough to be to split. There is a dial on the front of the amplifier so that it can be fine tuned to give the best possible signal - not too much amplification and not too little. 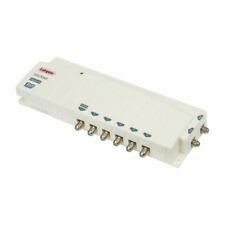 Distribute TV aerial output to up to six TV's without signal loss. 1x Amplifier. This SLx amplifier is designed to increase and distribute TV and FM aerial signals to up to six devices. Improves your TV picture especially in poor reception areas. 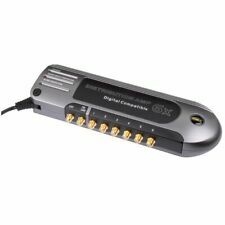 Distribute TV aerial output to up to six TV's without signal loss. This model features a full gain output which may be used to expand the distribution system. 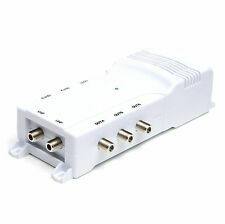 While the full gain output is 18dB, this allows the connection of another distribution amplifier or a passive splitter or tap.Mains powered. SKU : 007284. Separate inputs for VHF and UHF. Built in low noise amplifier with wideband output. 4G READY VHF/UHF DISTRIBUTION AMPLIFIERS WITH DC PASS. Distribution amplifiers with built in 4G LTE filter, designed to improve the quality of audio and video by amplifying weak VHF/UHF signals and distributing them across a designated area.